Now that its fall i have to say one of my favorite things to do around this time is go for a nice quiet trail ride through the forest with my best Horsie Friend. 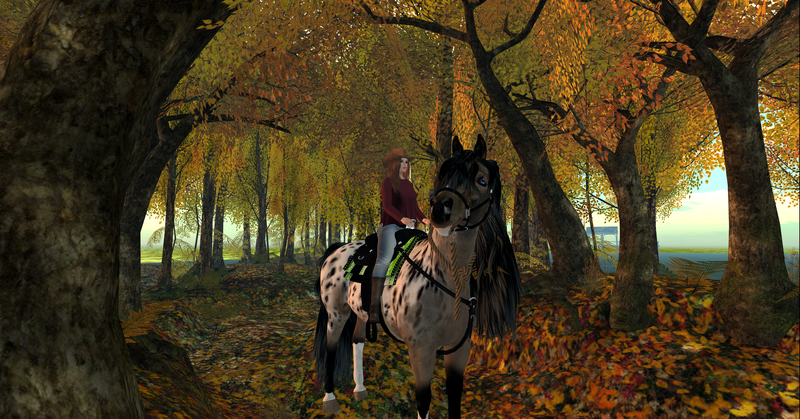 To just sit back in the saddle and listen to the birds chirp and hear the sounds of the crunching leaves under the horses hooves as she walks along is very relaxing! It’s My Birthday I’ll Cry If I Want To! Happy Tears of course! Logging in on my birthday to find a cake and a exploding balloon that fills the room with happy birthday writing is pretty cool! And my cake even sings the happy birthday song! Now if you excuse me i have a cake that’s waiting for me to eat it! Not your typical blog post today with fashion credits. Today i just wanted to be inspired and mess around with another new wind light setting that i downloaded. Hope you like! So this picture is kinda late getting to the blog lol but here it is! I gotta say im loving this new wind light i downloaded. Yes thats right if you didnt know all my photos are raw shots taken inworld with windlight only no editing from PS or gimp what so ever! Hey all! So first shout out to my followers! thank you so much for following my blog! I just noticed i’m up to 12 people following me! LOL! I know i’m a dork for being excited over that! But its my followers that make me want to blog! So thank you! Now onto other things…..
Have you noticed i seem to be wearing alot of white lately? LOL i dont know why! Just a quicky before i dash off into the real world today!